To accurately calculate how much turf to order, start by drawing a diagram of the area and measuring the dimensions. For irregularly shaped areas, divide into combinations of rectangles, triangles or circles, if applicable. Calculate the area of each shape in square metres then add the amounts together to determine the total area. Order an additional 1 – 2% to be on the safe side, and schedule delivery, or pick up, for when soil conditioning and leveling are completed. It is recommended that the area to be laid is sprayed with Glyphosate to remove all weeds. Be sure to use correct protective gear when spraying and leave for a minimum of 7, preferably 14, days prior to laying turf. This is when reticulation is installed or an existing system checked for accuracy of coverage and pressure. The sprinkler heads should be positioned about 20mm above the surface of the soil to allow for the height of the lawn. The area should be raked clean of any rocks and debris then smoothed (preferably screeded) to desired levels. Remember the less lumps and bumps in the surface now, will result in a better finish once the turf goes down.The level of the prepared surface should be 25 – 30mm below kerbs, pavers etc. for roll down lawn, 10mm for stolons. 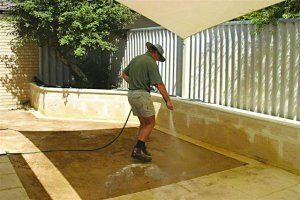 Plasterer’s sand is a very good, economic filler that will not cause a layering effect or inhibit water penetration.The area needs to be consolidated so that you can walk across it and not leave imprints with your feet. This can be achieved using a roller or by applying water to the area. You can improve your existing soil with some Dynamic Lifter and Sir Launcher. Dynamic Lifter is an organic soil improver that will put some goodies into your existing soil without changing its structure. It is applied at a rate or 30kg per 100sqm. Sir Launcher is a new and innovative product incorporating a starter fertiliser with the added benefit of quality moisture magnet water crystals. The water crystals swell dramatically when wet, trapping hundreds of times their own weight in water and soluble compounds such as fertiliser. This ensures the baby roots of your Sir Walter have access to water between watering times. It is different to a wetting agent in that wetting agents are designed to make your soil less hydrophobic, not hold onto existing water. Any Sir Launcher that is not used on your turf is great to use when you pot up your plants or new garden beds as it means that water is stored where the plant needs it, significantly reducing the need for hand watering between allocated watering days. If you are going to bring in outside soil it is important that the landscape mixes are not applied as a layer on top of the existing soil but incorporated into the top 200mm of the soil profile. If this is not done you will find that the turf will have a root system that will stay in the top layer. This will cause your turf to have very poor drought tolerance and a reduced ability to take up the nutrients that you apply. Layered mixes are a major cause of dry areas in summer’s first heat wave, not the beetles. It is a good idea to apply a wetting agent to the soil and water it in, as all of the work you have done moving the soil around will have worked a lot of the fines in the soil to the surface and dried out the soil making it hydrophobic or anti wetting, causing the water to pool and run through the subsurface, by passing the roots. Watering of your new turf is critical in the first few weeks. As the turf has no root system, it is relying on the water available within the turf layer. Depending on the weather you will need to water your turf at least two to three times per day. 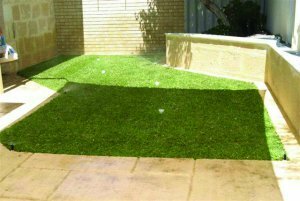 Once your lawn has been installed contact the Water Corporation to receive a watering exemption on the following numbers: Water Corporation Customer Centre: 9423 7777 or Waterwise Hotline: 131 039. Once the roots are down and you can no longer easily lift up a corner of turf you are well on your way to having an established Sir Walter Premium Lawn Turf that will provide yourself and your family with a lot of enjoyment.